Quick, Easy & No Bake? Make These Dog Treats Today! As the first days of Summer quickly approach, it's time to give our schedules and oven a break. 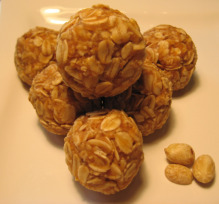 My easy no-bake Peanut Butter Oat Balls are a busy pet parents dream come true. They make about 32, 1 inch treats, plenty to keep your dog happy for several weeks. Simple - With only 3 ingredients, of which you may already have in your pantry, you can whip these treats up any time. Plus, you don't need any special equipment. Substitutions - You can easily make all kinds of substitutions to fit your dogs diet. Instead of milk, use a non-dairy alternative like unsweetened almond or coconut milk. Your dog doesn't like peanut butter? No problem, sunflower butter and almond butter are easy to find in most major grocery stores. And last, if you need to substitute the oats, you can use puffed rice or quinoa flakes. "I have made the peanut butter oat balls several times for my dog and her dog friends. I have yet to find a dog who didn't like them. Even some of the owners ate them, too." "My puppy absolutely loved them! I gave him a taste of it before I put it in the fridge and he looked back up at me like, "Can I have more?" lol it was too cute!" "My dog Duchess, a Siberian Husky, and my moms dog Leiah, a Toy Poodle, absolutely love these treats! They enjoy every moment of them from licking the spoon once they're in the fridge and then enjoying them for days afterwards!" Summer is all about Easy & Fun, so why make homemade dog treats difficult, time consuming and unpleasant? Both of my eBooks, 15 Easy Dog Treat Recipes and my second eBook Dog Cake Recipes for Every Occasion have quick, easy and delicious recipes with helpful step by step pictures. 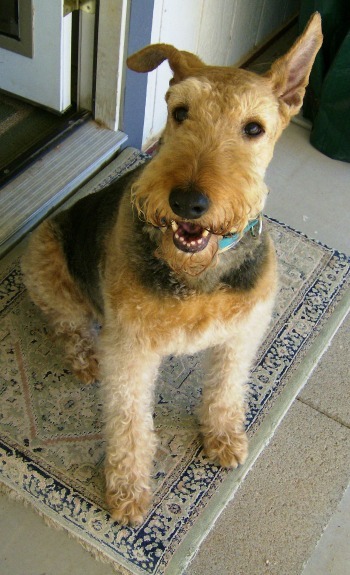 "Allie the Airedale's favorite meat was chicken. She would eat anything, but chicken was tops! 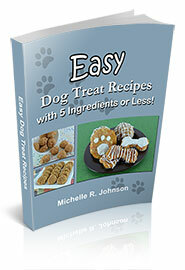 I made many of your dog treat recipes for her and she enjoyed every one. She knew she wasn't allowed in the kitchen when I baked so she would lie on the carpet in the living room and slowly inch forward so only her tail and one hind leg was on the carpet. The rest of her body was sticking out in the kitchen. But it was OK as part of her was still on the carpet. I would use about any meat I could get my hands on to make my 'dales treats--fish, beef, rabbit, chicken, whatever (as long as it was available). Thanks for providing us with fun, innovative, nutritious recipes." I'm so glad that I was able to help you bring your Allie some tasty and healthy dog treats while she graced your life. Thank you so much for sharing a funny and sweet memory of her with all of us. Share a picture and story of your dog and we'll make them the Featured Fan for a month. Or, If you'd like to send a tribute of your dog, please hit reply to this email, send me a picture and tell me about the special love you have for your four legged family member who is no longer with you in person, but will always be in your heart. "I am so glad we found this site and I have forwarded it to many Furr-Baby parents. Thank you so much."